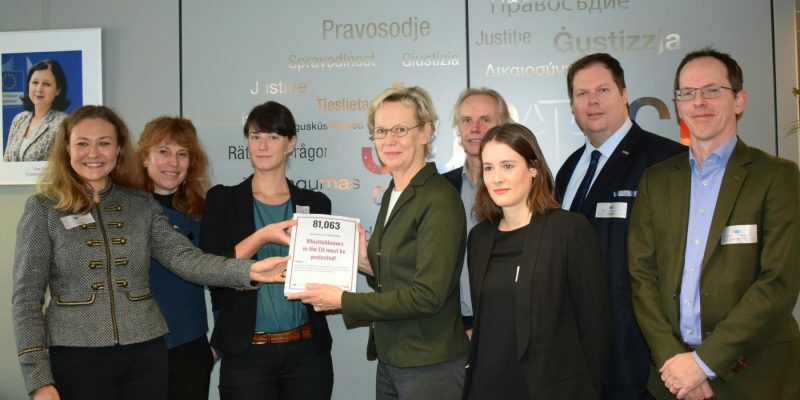 On 14 November 2017, representatives from the European Federation of Journalists, Eurocadres, the European Public Service Union (EPSU), Transparency International and WeMove.eu met with Tiina Astola, the Director General of DG Justice. They handed over the 81,000 signatures and the list of 80 organisations participating in the WhistleblowerProtection.eu platform. The platform and the petition were initiated by Eurocadres in October 2016 with the aim to push the European institutions to protect whistleblowers at the European level with a directive. The Parliament adopted, with a large majority, a strong report calling on the Commission to put forward legislation. The results from the public consultation on the issue have also recently been published. Of the 5.707 respondents 96% of individuals and 84% of organisations supported the establishment of legally binding minimum standards on whistleblower protection in the EU law. The message underlined from the platform is that there is no need for more recommendations. What we need is EU-legislation. The patchwork of different situations in member states and sectors put workers at risk, especially mobile workers. Tinaa Astola said that the European Commission is still looking at different options.